The Ramsey Ohio survey study introduced in Chapter 0.8 was so comprehensive that it allows me to determine four separate wrongful conviction estimates: one each for prosecutors, police, judges, and defense attorneys. 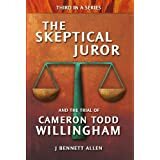 The prosecutors were the most conservative in their estimate, guessing that the wrongful conviction rate for the country is 0.8%. The police were the next more conservative group, guessing that the wrongful conviction rate for the country is 1.3%. The third most conservative group within the Ramsey survey was the judges’ group. 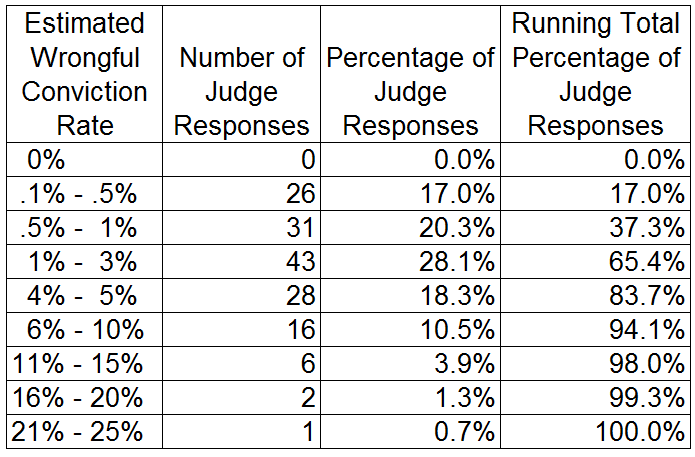 Regarding the survey question at hand, Ramsey received responses from 153 judges. Their responses are categorized below. 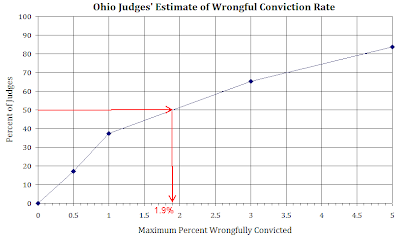 I will define the Judge Number for the wrongful conviction rate in the same manner I defined the Prosecutor Number: I’ll determine the median judge guess at the wrongful conviction rate using a plot. That plot is presented below. 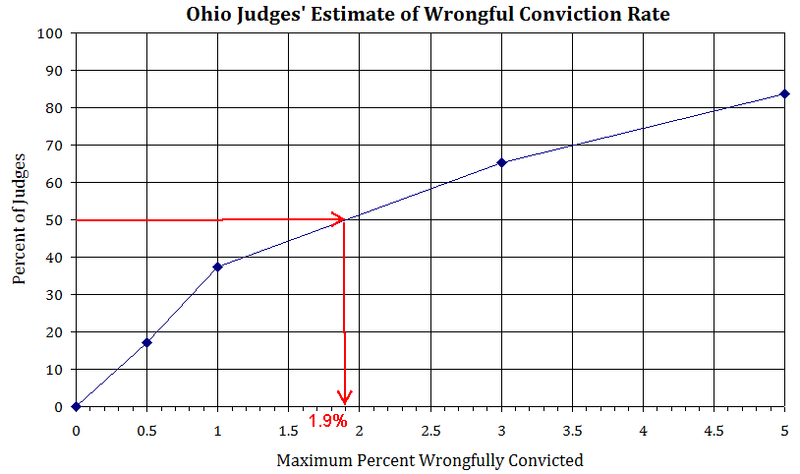 Based on the plot, I claim the single best number to represent the wrongful conviction rate estimated by the Ohio judges responding to the Ramsey survey is 1.9%. Consider the significance of the Judge Number. 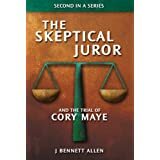 If it is applicable to all 2.5 million people we have incorporated, it suggests that even the judges believe we have 47,500 people wrongfully incarcerated in this country today. As mentioned in the earlier chapter dealing with the Ramsey survey, I noted that Ramsey was clever enough to ask for separate guesses of the wrongful conviction rate: one for the country as a whole and one for the respondent’s jurisdiction. It’s interesting to compare the two. For the judges, the national median guess was 1.9%, as just reported. 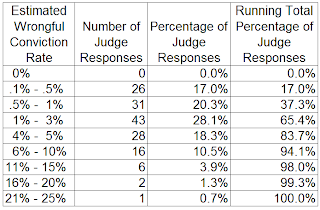 For that same group of judges, the median guess for their jurisdiction was 0.56%. On average, the judges believed the wrongful conviction rate in their jurisdiction was somewhat more than one-half that of the national average. This makes the judges slightly less delusional than the police or the prosecutors. For comparison, the numbers for police are 1.3% and 0.2%; that’s a factor of one-sixth. The numbers for prosecutors are 0.8% and 0.2%; that’s a factor of one-fourth. Ramsey was also clever enough to ask his respondents their opinion of an acceptable wrongful conviction rate. Slightly more than half the judges and police felt the acceptable rate was zero. Slightly fewer than half the prosecutors felt the acceptable rate was zero. Good for all of them. While no one is arguing a zero rate is achievable, it’s good that half of all police, prosecutors, and judges feel a wrongful conviction is an unacceptable circumstance. Perhaps they would be willing to help free some of the 20 to 50 thousand people they estimate are now wrongfully imprisoned. 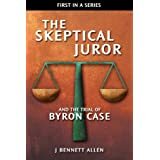 At the other extreme, one prosecutor and four judges thought 5% would be an acceptable wrongful conviction rate. Three police respondents also thought 5% was an acceptably-low wrongful conviction rate. Four police respondents thought 10% would be acceptable. Two of them thought 15% would be okay. Astoundingly, one police respondent thought that a wrongful conviction rate of 20% was not too high.